The present work aimed at optimising the design and operation of char utilization as a low cost catalyst for tars reforming. The effect of temperature, tars composition, light hydrocarbons composition, steam content and type of reformer on the conversion of tars and light hydrocarbons into additional syngas using sorted municipal solid waste (MSW)—derived char was systematically monitored. Reforming tests were carried out using industrial primary syngas produced by air gasification of wood chips and MSW-RDF in a commercial fluidized bed gasifier. Up to 85% of tars present in the primary syngas have been converted to permanent gases at 871 °C, while passing through the catalytic fixed bed of char, for 1.4 s, at atmospheric pressure and syngas space velocities in the 3500–4000/h relative to the char in the bed (0.82 NL/g h). Content of multi-ring aromatics decreased following the passage of the syngas through the char bed leaving naphthalene and xylene as the predominant residuals. Propane, propylene and ethylene were completely converted. Up to 30% methane conversion was reached at 925 °C while ethane conversion was only occurring under high steam content of 65 vol%. 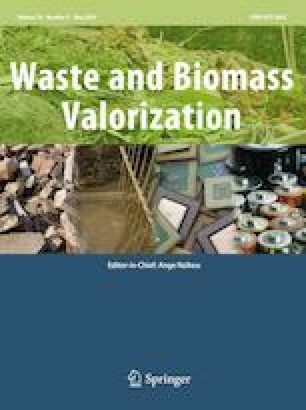 The authors are grateful to funders of the Industrial Research Chair on Cellulosic Ethanol and Biocommodities of the Université de Sherbrooke and NSERC (CRDPJ 486964-2015) for their support, to Esteban Chornet for his guidance throughout this project, and to Boris Valsecchi for technical assistance. The authors would also like to thank MITACS (Grant Number IT03931) for supporting Dr Gnouyaro Palla Assima’s salary during the project.